This is a self-selecting, inspirational, immersive art experience in three scenes. I have designed and made a smart phone app that transcends a purely informational use, its presence is anchored to 3 surreal soundtracks, each travelling through time – ‘bringing back the bygone‘. The old metal teapot approaches you, bobbing about on an invisible sea. You get a sense of itself and its past, a vessel for holding liquid is now empty, buyoant and surrounded by water. This lowly tarnished object is the only survivor from a storm that swept its environment of a beach hut out to sea, along with many more. This is triggered from a postcard depicting a picnic outside a Bexhill beach hut, and is narrated by the voice of someone with fond memories of this place. In addition you can encounter bygone sites that sadly did not survive the elements, wars or council changes in traffic control ! Apparitions has 2 more 3D models of bygone heritage sites specifically St Leonards Pier and The Clocktower Memorial . Once more these can be triggered anywhere you like, on smart phones by downloading a free app when viewing specially encoded vintage postcards. Combining augmented reality with a time-travelling immersive audio experience, to be launched 1st September 2018. It is a significant exploration of the impact of cutting edge ‘augmented reality’ technologies on memory & experience. 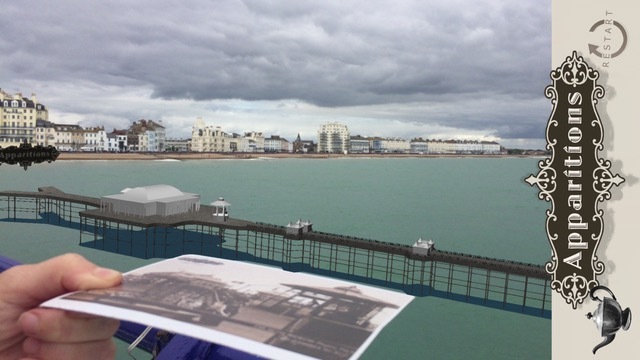 Focussing on my hometown of Hastings & St Leonards I will recreate locations such as St Leonards Pier (destroyed in WWII) & the Albert Memorial (lost to fire in 1973) as virtual 3D models viewable using smartphones. The work will launch as a downloadable app during Coastal Currents Festival 01.09.18 with a showcase event at Hastings Museum 22.09.18 (who hold related objects in their collection). Presentations will take place at the Burton’s St Leonards Heritage Society, Brighton Digital Festival & the Universities of Brighton & Greenwich, accompanied by a press campaign. For more details go to the Apparitions website.